In 1863, Lawrence being a strongly pro-abolitionist city in "free-state" Kansas, attracted the ire of pro-slavery raiders from neighboring Missouri headed by William Quantrill whose group conducted a massacre of some 180 men and boys, reducing the city to smoldering ruins. Banding together to re-open its stores and businesses and aided by the arrival of the railroad, Lawrence, Kansas rose from the ashes to become what today is recognized as both one of America's best college towns and best places to retire. 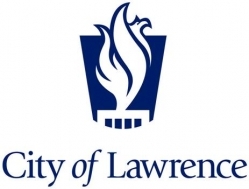 Adopting the mythical phoenix as a visual expression of the city's motto, "From Ashes to Immortality", the logo of Lawrence, Kansas is a beautifully crafted mark which is both distinct and historically appropriate.